This precision milled, Large Keyless Chuck with a large diameter knurled body provides plenty of hand torque for tightening and if that's not enough, three 5/16" diameter holes are provided for use with a spanner wrench (not included). 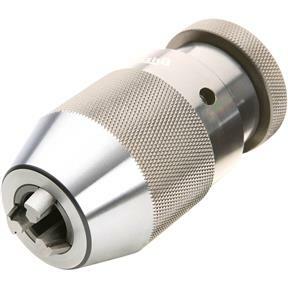 Overall size is 2-3/4" diameter x 5" long.Specifications:JT33/16"-3/4"
This precision milled, Large Keyless Chuck with a large diameter knurled body provides plenty of hand torque for tightening and if that's not enough, three 5/16" diameter holes are provided for use with a spanner wrench (not included). Overall size is 2-3/4" diameter x 5" long. Great Quality, however I wish it was made in USA. ALSO, more dimensions are needed in catalog description. I bought this for my wood lathe. It works perfect. Great chuck. Holds the attachments with the slightest of ease.